Strippit Punches: Can you replace the guide bushings in your turret? 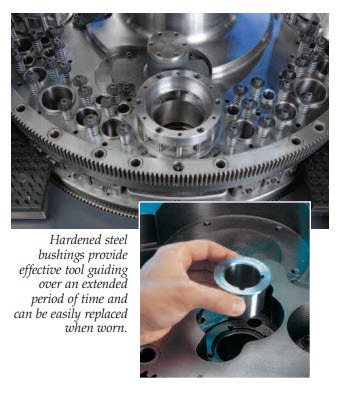 Hardened steel guide bushings ensure accurate punch and die alignment and are keyed to accept shapes in every station. Bushings can be quickly and easily replaced by the machine operator, eliminating the need for costly remachining of the turret. This entry was posted on Tuesday, April 3rd, 2012 at 9:35 am	and is filed under Punch Press, Uncategorized. You can follow any responses to this entry through the RSS 2.0 feed. You can skip to the end and leave a response. Pinging is currently not allowed.